The solid yet gelatinous blob felt pleasantly slimy in my hand when she handed it to me. Although we stood waist deep in the Namekagon River just below its headwaters dam, neoprene wetsuits protected us from the surprising cold of late August water in 2015. 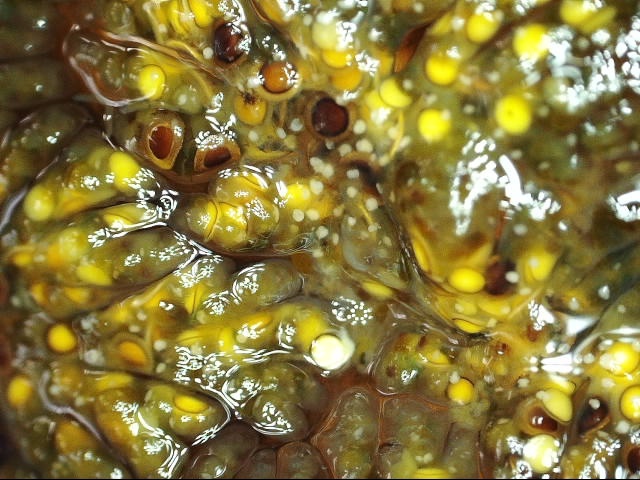 When we showed the patterned blob to scientist Dr. Toben Lafrancois, he recognized it immediately: bryozoan. It was a colony of tiny invertebrates all clinging to the stem of an aquatic plant. An underwater photo of the bryozoan we found that day. I suppose that I shouldn’t have been surprised, because this group had been snorkeling and studying river ecology with Toben and Ian Karl, the Experiential Program Coordinator, all summer, as part of Northwest Passage’s “New Light under the Surface” program. Through a National Park Service Youth Partnership Program grant, these at-risk kids had been armed with waterproof cameras, wetsuits, and snorkel gear, and were trailblazing a new realm experienced by incredibly few, all while developing healthy life habits. My afternoon with the girls was incredible. I’d never seen that side of the river before, and I enjoyed being the student as they helped me learn to snorkel, use an underwater camera, and follow safety protocols. Memories of that day have stuck with me, with the lumpy mass of the bryozoan rising to the top as a sort of touchstone. So this fall, when I received several photos of bryozoans with identification requests, memories of that snorkeling experience bubbled up, and I decided it was time to investigate further. Local artist Sarah Balbin kindly led me out to a patch she’d found on the narrows of Picture Lake near Cable, and I collected a small specimen to examine later under the Museum’s new digital microscope. Thanks for the guide service on your beautiful lake, Sara! With my sleeve rolled up, I plunged my arm into the cool water and tugged on the plant stem bisecting the bryozoan. The dead, decomposing stem released much more easily than I anticipated, and soon I was looking at a pair of mini-football-shaped colonies on the deck of my kayak. While the blob looked more like a patterned glass art piece than a living being, it is actually formed of hundreds of genetically identical, physiologically interconnected animals called zooids. Each individual zooid is made up of an outer sleeve-like structure, a mass of organs that can move within the sleeve, and the lophophore, which is a ring of tentacles that filters food particles out of the water. Altogether, a zooid may be only 0.5 mm long, so none of this was visible to my unaided eye. 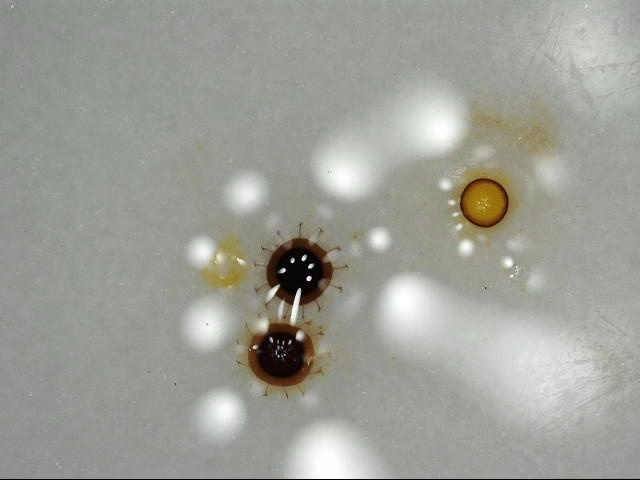 While each zooid is capable of independent feeding, digestion, and reproduction, they share certain fluids and tissues that unify the colony, and it’s impossible to separate them entirely. Back in the office, I examined the bryozoan under our nifty new microscope. (Thanks for the gift, Dr. Vernier!) The brown and yellow pointillist designs I’d admired in the field resolved into a conglomeration of various-colored polka-dots, often with concentric rings. Nothing looked remotely like the feeding tentacles I’d read about. I snapped some photos through the scope and sent them off to Dr. Lafrancois for clarification. Statoblasts in various stages of development. Statoblasts that have become floatoblasts and are ready to float away! “They are statoblasts,” he wrote back, “or dormant buds getting ready for winter.” While bryozoans can reproduce sexually, they also produce these statoblasts, which are sort of like tiny “survival pods” that develop while attached to zooids. Inside each bivalve-like chitin shell hides a proto-zooid with some stored food. The statoblasts of some species contain a gas bubble that will float them up to the surface. Others drift on a current or just sink to the bottom. 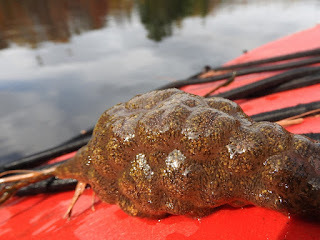 Apparently, the various shades of brown and yellow represent various stages of statoblast development, and their prevalence is a result of the bryozoan’s autumnal push to create clones who can survive the winter. The bryozoan colony will die as temperatures drop, but statoblasts are incredibly durable and can survive long periods of dormancy, freezing, dehydration, and even transport in the gut of a duck or the ballast of a ship. In the spring, the proto-zooid will grow, bud off more zooids like itself, and form a new colony. By fall, colonies have reached their largest size, and people notice them more frequently…prompting them to send photos to me, and me to finally write about this incredible creature. As I scooped the bryozoan off the microscope stage and back into its plastic bag, the texture of it in my hand brought back memories of snorkeling with those girls in Namekagon River. We were all waist deep in discovery on a sunny August afternoon. Our first portage was a doozey. Angular boulders jutted into the landing, and then a jagged natural staircase climbed a steep hill. We hoisted our Duluth packs, flipped up the canoes, and exuberantly navigated the obstacles. 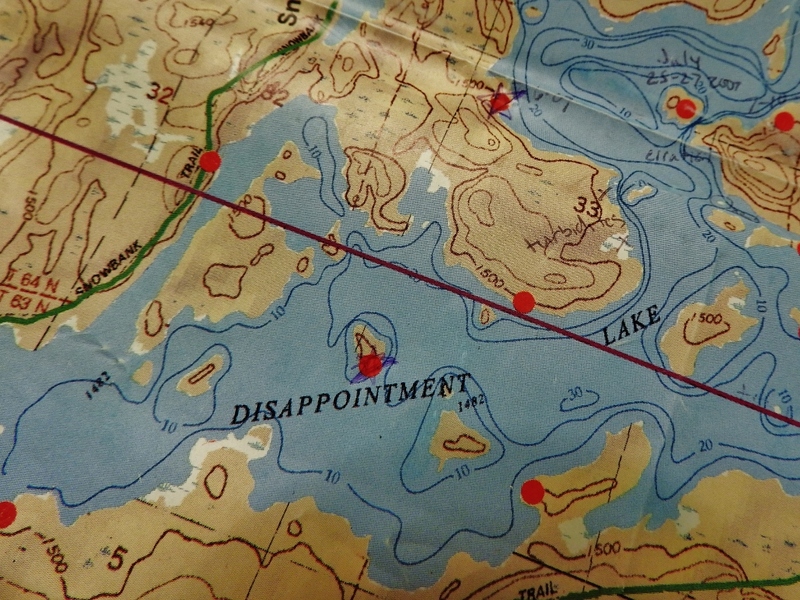 Somewhere, about halfway across the 80-rod portage, we crossed the invisible border of the Boundary Waters Canoe Area Wilderness. For my parents, our friends, and me, it was like coming home. My dad and our friend Marlene brave the first portage from Snowbank into Parent Lake. 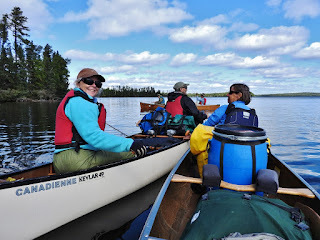 The search for a lunch site had just begun when we paddled past the northernmost campsite on Parent Lake. An even canopy of sturdy red pines caught my eye. With rain and storms in the forecast, this campsite promised protection from wind and lightning, and good options for hanging rain tarps. A gently sloping rock at the water’s edge and a sandy beach all checked off more requirements in my head. Even though we’d planned to do one more portage that day, this campsite was where we wanted to be for the next three, rainy nights. Staying here was a good choice. 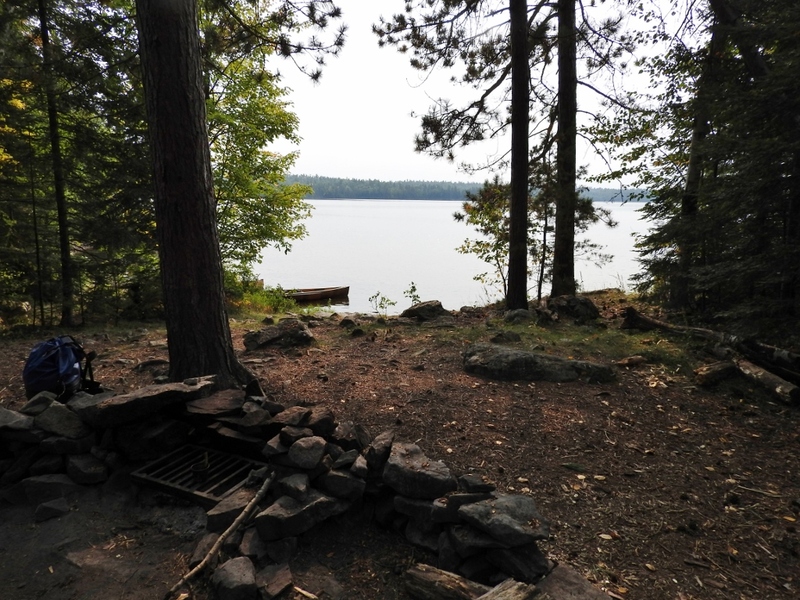 On every portage, campsite, and lake, rocks shape our experiences, and they play an integral role in almost every aspect of a trip to the Boundary Waters. Rocks are prominent here because thousands of years ago the glaciers scoured off topsoil, loose sediment, and even layers and chunks of the bedrock itself. 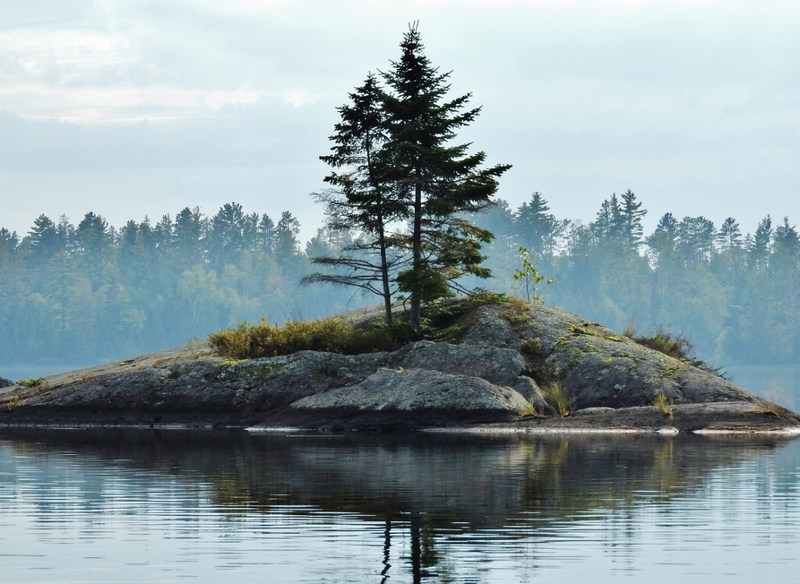 What remains is the foundation of the Canadian Shield—the heart of the continent. 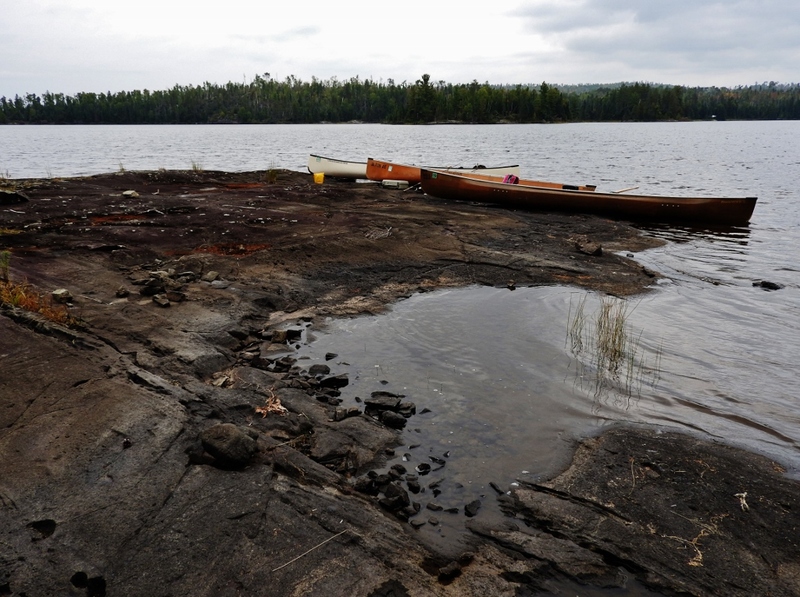 The tangible geology of the Boundary Waters began 2.7 billion years ago with the formation of the Ely Greenstone. 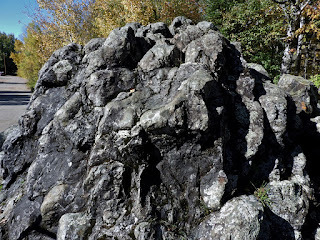 I’d waved at roadside outcrops of this ancient stone as we headed out of town that morning. These rocks originated as molten lava oozing out of a rift into cold seawater. The temperature difference caused the lava to cool quickly and form piles of pillows, or rounded globs with an appearance somewhat reminiscent of the stuff in a lava lamp. Later metamorphosis under heat and pressure caused the formation of green, chlorite mica crystals and preserved the pillow structures. As much as 5,000 meters thick in places, these pillow basalts formed a base for even more volcanism. The Pillow Rock in Ely is basalts metamorphosed to greenstone. The oozing basalts eventually gave way to explosive eruptions, and volcanoes climbed out of the depths of the inland seas and became islands. Can you spot my x? It's right in the center of section 33. We paddled past plenty of islands to get there, but none of them were volcanoes—at least not active ones. Turning into the boggy bay marked by the x, we pulled our canoes up on the gently sloping, gray hump of a rock just barely breaking the surface of the lake like a breaching whale. The whale had stripes. Not stripes of color, but bands of different textures were plainly visible. There’d be about a foot of smooth, gray rock, bounded on either side by sections pitted with oblong cavities. Looking closely, I could see that one side of the pock-marked area gradually changed from bigger to smaller holes until it became solid, while the other side went from holey to solid in an abrupt line. In this photo I'm pretty sure that "up" is to the right. This was the turbidite I’d been looking for. It originated over 2 billion years ago on the side of one of those ancient volcanic islands. Tectonic activity under the volcano shook loose an avalanche of loose sediments mixed with water. As this turbidity current tumbled down the slope, rocks of all sizes got caught up in the dense, muddy slurry. Once the flow began to decrease, big rocks settled out first, then smaller and smaller clasts until just the fine sands and clays were left to sift down in calmer waters. Subsequent earthquakes spurred more turbidity currents, and layer after layer of these graded beds built up in the basin. Being buried deeper led first to lithification (rock formation) of the sediments and then to metamorphosis. Finally, years of erosion brought our rock back to the surface. With the help of Tom in 2007, I’d learned to read this rock. The once-vertical layers had been turned on their side. Pitted bands represented layers of bigger rocks whose softer minerals had eroded away faster than the harder matrix of ancient mud. The smooth stripes were composed of smaller grains of sand and clay. 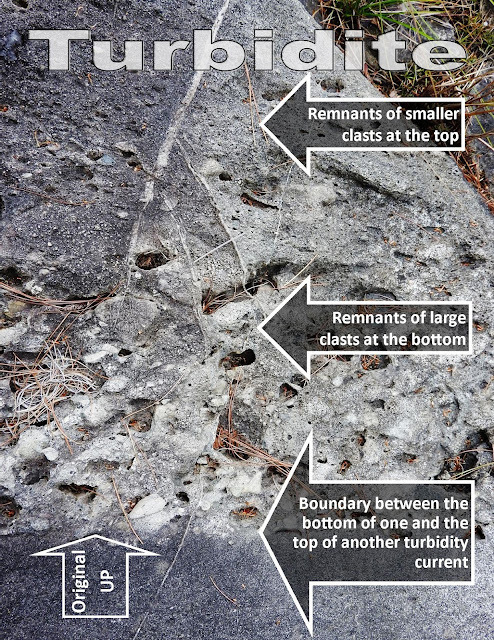 By looking at which side of the pitted stripe graded into smaller clast sizes instead of transitioning abruptly at the bottom of a new bed, we could tell what direction had originally been up. Each of us took a few seconds to imagine standing on the side of the volcano when these sediments were first deposited. Today, geologists could apply a few different names to this rock. It’s a metagraywacke, or muddy sandstone that’s been metamorphosed. It’s turbidite, or a rock formed by turbidity flows. Some people even refer to the pattern as a Bouma Sequence.My family enjoyed learning those words, but most Boundary Water’s paddlers would just call it a lunch rock. 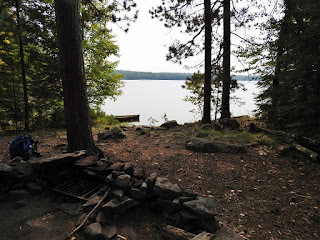 For me, though, rocks play such a fundamental role in every Boundary Waters trip that knowing about their journey makes my own just a little more meaningful. Some things never change. This fall I watched those same flocks of birds, drifting seeds, and swirling leaves. I took a net to the cold-hobbled bumblebees and gathered specimens for use in our next exhibit. And, on one deep-blue evening, as a glorious pink sunset shot through the clouds, a pair of geese swung down out of the tentative stars. Their wild honking sent a chill down my neck, and I let the kayak paddle rest while they dipped lower and lower toward my bow. Powerful wings sent ripples scooting across the lake’s glassy surface, and then lifted the geese back up just long enough to reach the far, dark shore of the lake, where they vanished. As I turned to paddle home, a half-moon sent its own ripples across my path. Lois continued, “It is difficult to explain the feeling of nostalgia, of longing, yearning, created by the sight and sound of flying geese. What sound turns eyes skyward more surely than the calling of wild geese? The eyes follow their passage and as the voices fade and forms become receding, wavering motes, we turn again to everyday affairs with an inward sigh of vague, unexplainable regret. 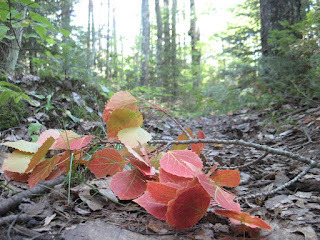 “Summer has gone, and we deplore its passing. 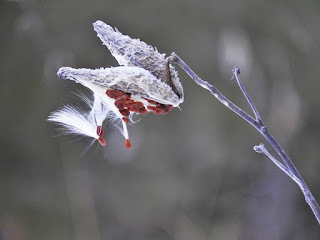 But the transient, delicate beauty of flower and leaf is not lost forever; it is simply laid aside temporarily to be superseded by other beauties, different but equal. Falling leaves disclose the graceful structure of trunk and limb as lacy networks against the sky. Leaf-darkened woodlands are once again open and airy, and one can see deep within places that a short time ago were walls of green. “Birds’ nests, once well hidden, now hang openly on naked branches, revealing by their architecture the nature of the builder. The nests of hornets and the cocoons of the great moths are also exposed to seeing eyes. Among the seasonal changes of field and forest, humans set about their own complementary autumnal routines. I don’t have a fireplace or woodstove, so I content myself with smelling other people’s morning fires on my way to work. Then at home in the evening I bundle up in a down vest and put a flannel bag full of rice, heated in the microwave, by my feet. Lois had a much nicer way to keep her toes warm. She wrote, “The now familiar energy crisis has many connotations; most of them unpleasant, but for me there is one very positive aspect, based as much on sentimentality as on practicality. This is the swing back to wood as fuel and the accompanying sight and scent of woodsmoke. “Especially on chill evenings there is something very comforting in the sight of smoke rising from neighboring chimneys and the fragrance of different kinds of wood mingling on the frosty air. This is nostalgia time, for one of the treasured memories of childhood is walking home from school in the winter twilight and seeing across the snow-covered fields the lamplight glowing softly from kitchen windows and smoke rising from chimneys—the first warm breath of home fires with their promise of warmth and security. “It also meant, of course, wood boxes to fill before dark: one for the kitchen stove, another for the living room heater. For in those days, wood was not a supplementary fuel, but the only fuel. Now, again, woodpiles grow in back yards and the crack of the splitting axe rings through the air. “Blue-white smoke rising from chimneys not only speaks of warmth and comfort within, but tells wind direction and strength and, to some degree, the atmospheric conditions. In years past this was my only barometer. “For many, wood is not just a supplement to ease the burdensome expense of gas or oil. A few have gone all the way and reverted entirely to wood as fuel. Cooks are learning once again the satisfaction of soups and stews and bean pots simmered long and slow on a wood range and the comfortable sound of a teakettle singing on the back of a stove. Happily, those who are lucky enough to have fireplaces kindly share the sight and smell of their woodsmoke with the rest of us. I was standing at the information desk, in the foyer of Lakewoods Resort, when the lichenologist returned from the field. Matt Nelsen is a postdoctoral researcher at the Field Museum in Chicago, and he gave a talk on lichen biology during the recent Northwoods Foray of the North American Mycological Association. 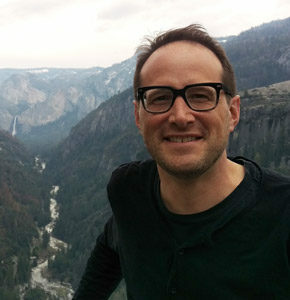 This is what a lichenologist looks like ;-) Matt Nelsen. I’d missed his talk due to my coordinator duties, so I eavesdropped eagerly as he chatted with a colleague about a chunk of dead wood he was holding. 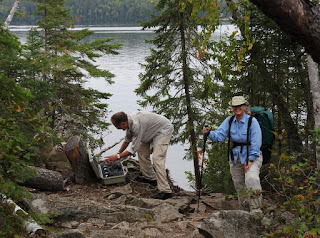 He’d been out exploring the Rainbow Lake Wilderness Area northwest of Drummond, where, in 1990, the U.S. Forest Service had found 190 species of lichens during a survey. According to Matt, he’d just happened to notice a decorticated snag that looked like it would be prime habitat for pin lichens. He said this with a lopsided smile and self-depreciating chuckle. Yes, scientists are aware that many of the words they use could be replaced with plainer language. Decorticated simply means the bark, rind, or husk has been removed. In the dictionary, “decorticated peanuts” is given as the example. In Matt’s defense, texts on lichens use the word decorticated frequently and, in my opinion, big words can often add poetry, precision, and entertainment value to a sentence. Anyway, Matt was right. The decorticated snag was covered in pin lichens. When he held out the specimen of fibrous wood he’d sliced off so that we could get a better look, all I could see was a little black stubble on the surface. 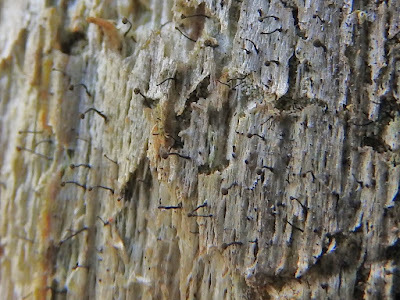 Existing right under our noses, but mostly beneath our notice, pin lichens form a black stubble on the exposed wood of bark-less trees. When viewed up close, they reveal a whole new world. Photo by Emily Stone. That was enough to pique my curiosity, though, and I followed Matt downstairs to the voucher room, where scientists worked with microscopes, technical keys, and each other to identify the more than 600 types of fungi collected at the foray. 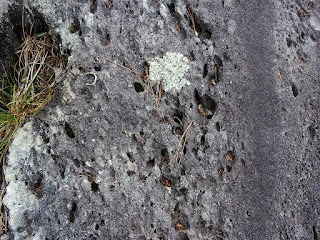 Although lichens are a symbiotic relationship between a fungus and an alga, they are classified by their fungus, and so their study traditionally falls under the jurisdiction of mycologists. Scientists doing science at NAMA. One of those mycologists had brought with them the most amazing dissecting microscope I’ve ever seen. This type of microscope is meant for viewing objects through relatively low magnification, as opposed to a compound microscope that uses higher power magnification to look at things like bacteria and cells. The paired eyepieces provide for three-dimensional viewing, and lights all around the microscope’s stage illuminate the subject perfectly. On the way downstairs, Matt had rattled off a bunch of the pin lichen’s unique characteristics. Some species of pin lichens are used as “old-growth indicators,” because they are picky about their habitat being undisturbed. 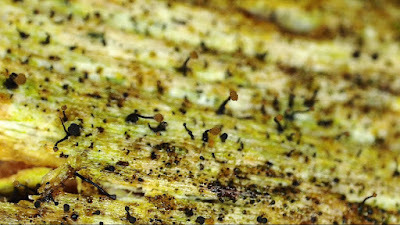 The thallus, or body of the lichen, is inconspicuously buried in the wood. Each of the pin lichen’s “pins” is a stalked apothecium—a type of reproductive structure. At the tip of each stalk is a capitulum—a round cluster of dark brown spores enclosed in a thin membrane. 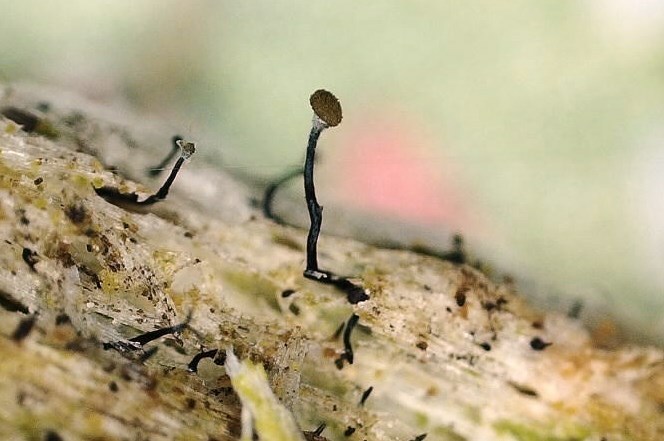 Unlike many fungi who actively expel their spores, the outer coating of a pin lichen’s capitulum simply dissolves, and the spores might cling to the fur or feathers of passing animals, or be dispersed by wind or rain. Underneath the capitulum is a ring of yellow-green crystals containing vulpinic acid, and whose purpose is unknown. The Museum has a brand-new digital microscope (Thanks to a donation from Dr. Ed Vernier!) Our lighting isn't as good as the professionals used, but it is better by far than the macro lens on my digital camera! So, this is the best photo of a pin lichen I've been able to capture...yet. After Matt placed the drab chunk of wood on the microscope’s stage, it took me a few minutes to adjust the eyepieces and focus. As a naturalist, most of my training has been in looking at the world from the “thousand foot view,” with the naked eye, or with a hand lens. This was a whole new world. Linear ravines and ridges ran the length of the pale, fibrous substrate. On those ridges grew a savanna-like spread of Dr. Seuss-like, stalked, apothecia “trees.” And decorating the lower canopy of each “tree” was a ring of luminous green crystals. I felt like I’d just discovered a forest with its foliage made of gemstones. Up and down I focused, immersing myself in this fairyland. My eyes galloped over the ridges, alighted in the canopies, and shimmied up and down the slender-stalked apothecia. How does something as beautiful as this exist in our world with so little notice taken of it? 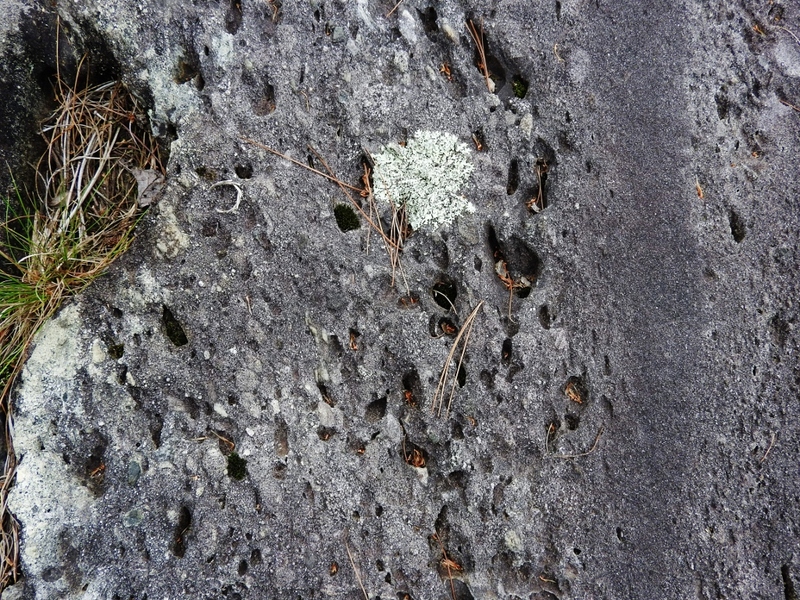 Any lichenologists reading this are probably chuckling at my naivety since they learned about it long ago. A portion of the rest of you probably think I’m crazy, and maybe a few others are grabbing their boots, hand lens, and knife to go investigate the nearest decorticated tree. 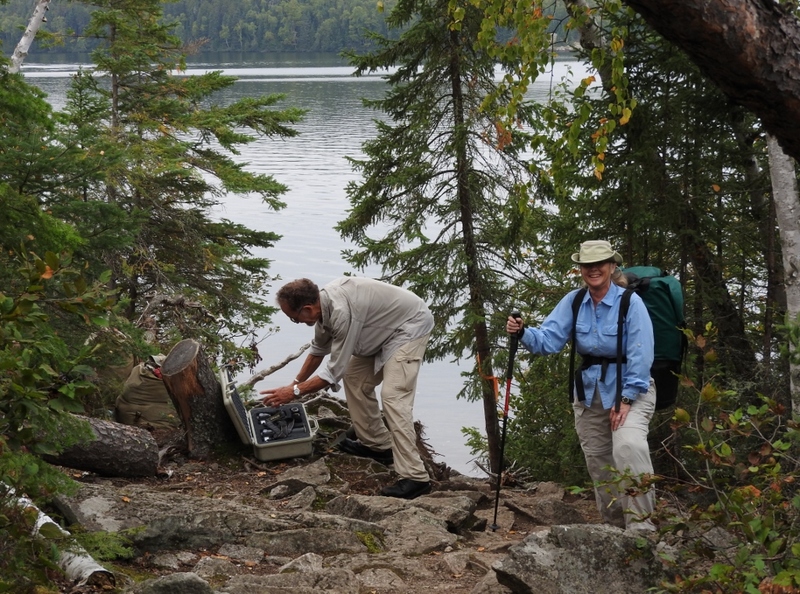 Looking for lichens in Wisconsin should be pretty easy—there are over 662 species recorded from across the state, and 255 of those are found right here in Bayfield County. So, filled with wonder and my new knowledge, I wanted to see if I could discover pin lichens again, this time on my own, in their natural habitat. Remembering Matt’s words, I headed down the street in search of a decorticated tree. 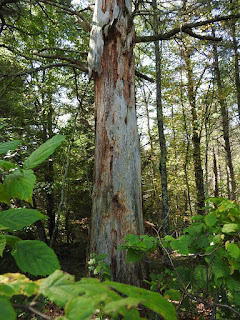 At the edge of the forest in the Museum’s natural play area stood an old, bare white pine that I’d never paid much heed. Nosing in, I found them right away. Tiny black pins covered at least three square feet of the snag’s sunny side. Each new natural neighbor I discover becomes a friend whom I can meet up with during a day in the woods. A stop on your next journey of discovery!